Behold, we have found our new favorite party heels thanks to a sale the Shop With Us team spotted online! Not only are these pretty pumps by Gucci, the beloved brand that seems to never go out of style, but these shoes are also available on sale for 40 percent off. Excuse Us while we move these stunning sparkly Gucci shoes into our carts just in time for the holiday parties on our calendars. Gucci is responsible for some of our favorite (and iconic) celebrity looks. Rihanna is known to step out dripping in Gucci for all occasions including for an Instagram shot to partying at Coachella. Additionally, no shoe lover can ignore those Original GG Canvas shoes, which were likely the most popular street style over-the-knee boots this year. Also, we will never forget how Lupita Nyong’o twirled in the jade-green Gucci gown at the 2015 Cannes Film Festival. Of course, it is only right that we treat ourselves to our own pair of Gucci heels to strut in for the remainder of this year and beyond. 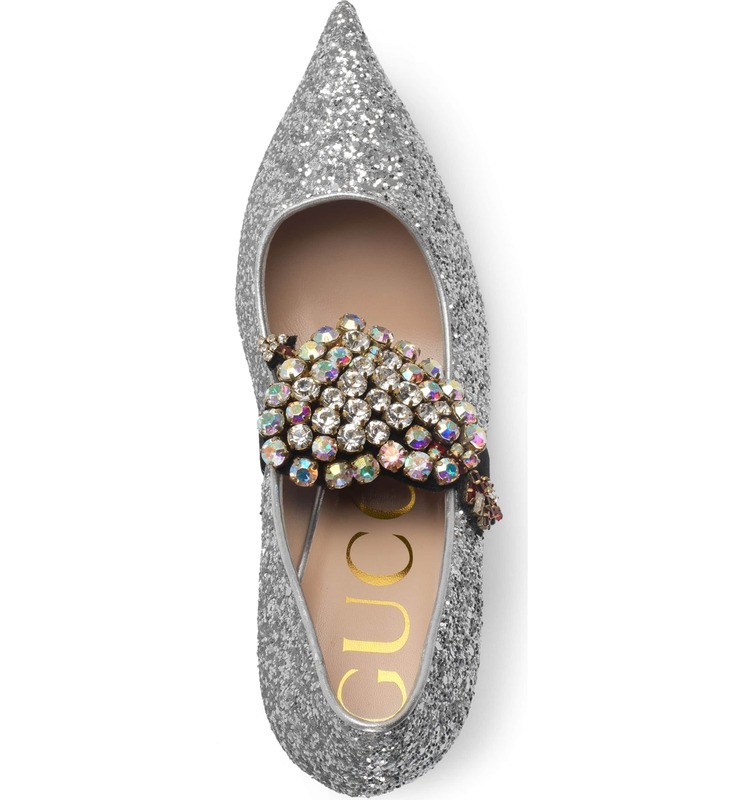 Enter the Gucci Virginia Glitter Pump! 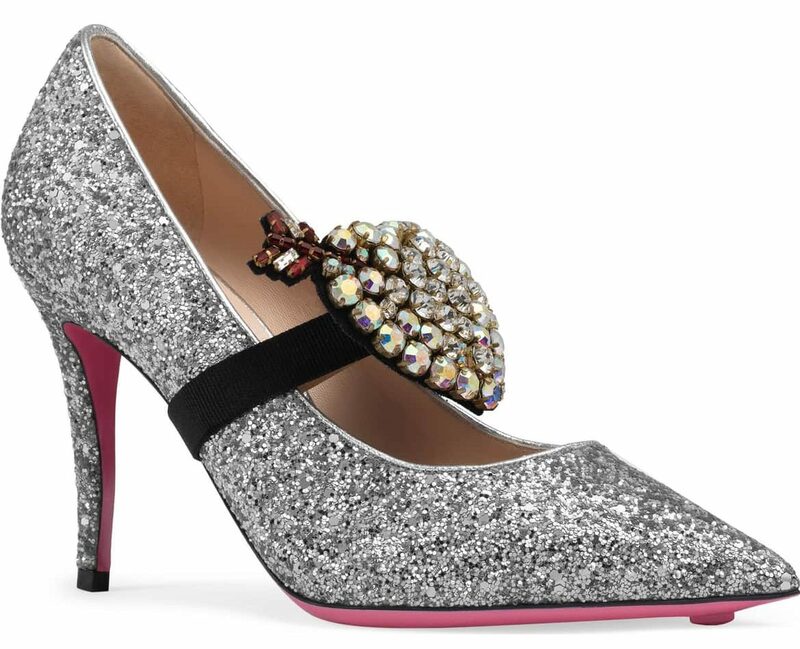 From the all-over glitter design with a complimentary pink sole and a crystal heart brooch wrapped around it — everything about this Gucci shoe is playful yet sophisticated so a shopper of any age could wear this shoe and look amazing. If those obvious details do not set the Virginia heel apart enough, it also has a slightly curved willow heel that only ups the ante in elegance. See it: Snag the Gucci Virginia Glitter Pumps (marked down 40 percent off their original $1,200 price, now $720) while so many sizes are still in stock. Not your style? Check out other Gucci pumps at Nordstrom! The crystal heart is actually removable and we love that there is a convertible feature for such a beautiful footwear design. Anytime we prefer to go the simpler route, we can slide off the brooch and put it aside to serve up a classic glitter shoe look. Basically, this shoe offers two looks in one! Check out how the brooch dazzles from the top view. Sizes range from 6 to 10 but Nordstrom shared that this shoe runs small so it is important to pay attention to the size guide and order one size up for the most comfortable fit. Because we wouldn’t be the ultimate shopping friends if we didn’t perform a thorough search, we also found this shoe available in different colors and textures! We can already picture so many different outfits that these eye-catching shoes will work with! The shoes are so fitting for a New Year’s Eve party, particularly since many shoppers prefer to step out in metallic and sequins. They are a chic way to bring the sparkle for the countdown to the New Year without going the typical style route. For the sparkly heels, we can go for a super street style look with a boyfriend style long-sleeve button-down shirt and skinny jeans in a lighter wash. A sweater or blazer can easily top the boyfriend shirt for an extra layer. We will also be pairing the black version of the pumps with our favorite one-shoulder sweater and skinny pants for a fun date night or event with a trendy dress code. Both pumps will easily step up a basic sweater or shirt dress! Shoes like this also call for a lovely clutch or cross-body bag. While we have to have these pumps for ourselves, they are still a great gift for anyone wanting to treat a loved one to a little luxury footwear. The heels are perfect for the fashionista who loves making a statement with shoes yet they manage to also be an appropriate wildcard for a shopper who simply wants to step up their collection of shoes and accessories with more playful designs. Anyone who really wants to splurge and turn these shoes into the ultimate holiday present may want to snag this matching Gucci Crystal Heart Keychain. Cue the heart eye emojis! 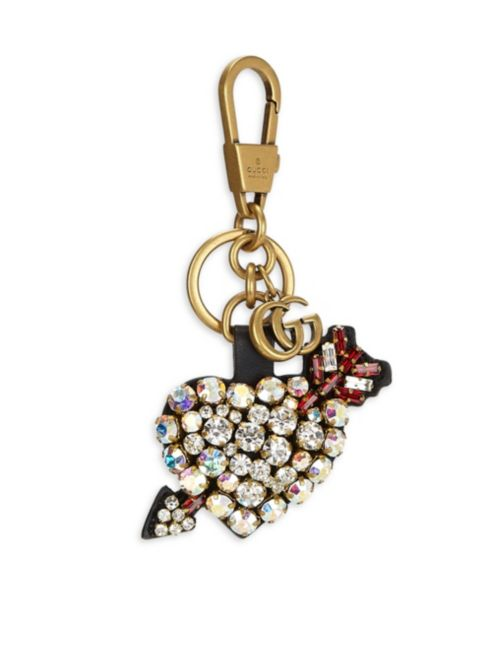 See it: Get the matching Gucci Crystal Heart Keychain (marked down 30 percent off its original $510, now $400) while it’s still in stock at Saks Fifth Avenue. Admit it: The match is just too perfect! We cannot wait to hit the town in these fabulous Gucci heels that are sure to elevate our entire going out style.